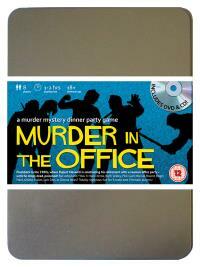 You've been invited to play the role of PHIL CASH in Murder In The Office. Who killed the boss? Everyone has stayed after work to attend Rupert Maxwell’s retirement party. Not because they like him, but because they want to make sure he is really going, once and for all. With no expense spared, his P.A. has organised an Eighties throwback disco and the cheapest bubbly money can buy - but just as the party starts the bloated M.D. falls down dead. Find out who made Maxwell’s party a real choker! Accountant (his great mathematical mind has left his body behind!) Costume : A checked woolly jumper and brown trousers softens your hard man of accountancy image. A brand new calculator gives the right impression despite being coupled with a well thumbed ‘Beginners Guide to Accountancy’ book. You were always good at maths, so it’s no surprise you’re the accountant at Maxwell Enterprises. You’ve worked here almost as long as Donna and Maxwell himself. Most people think you’re quiet and shy, but you’re just hard-working and there’s usually plenty of paperwork to keep you locked up in your office.